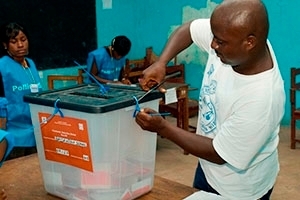 Following 14 years of war, Liberia has held two peaceful, democratic elections. The results of Senate and other upper-house elections from 25 countries, including the United States, are now easily accessible through the website, www.electionpassport.com. The project, led by David Lublin, professor at American University's School of Public Affairs, marks the first time that global Senate-level election data can be found in one place. "Senate elections are highly significant, particularly in those countries where direct elections are held," said Lublin. "As in the U.S., legislation often requires approval from houses, so studying just one house means you are missing one-half of the picture. It is critically important to preserve the electoral history of the world, particularly in nations where this information may not have been kept otherwise." The online dataset -- from countries as diverse as Belgium, Poland, Switzerland, Zimbabwe, and Burma – is arranged by constituency and currently contains results from a total of 184 elections, including all U.S. Senate elections since 1998. It includes historically important documents from countries where election results have never been digitized or publicly available in the past. Lublin's 2014 book entitled Minority Rules: Electoral Systems, Decentralization and Ethnoregional Parties Success, and a series of articles he wrote for the Journal of Politics and the British Journal of Political Science spurred the creation of the online database. It took his team more than a year to gather election results of legislative races in 25 countries and to consolidate them for future research and for anyone who is fascinated by the world of politics. "It will be free and open to academic researchers and researchers may be able to study elections by incumbency, and possibly gender and ethnicity," said Lublin. "It could also be used to help assess vote manipulation in less-free countries." The database was completed with the support of AU's School of Public Affairs and its Center for Latin American and Latino Studies. Lublin worked with research assistants and translators to help collect and format the information from each state and country for the central clearinghouse. He plans to expand the database, updating it with more countries and additional sets of results as they become available.